Schottky diodes are composed of a metal in contact with a semiconductor. Despite their simple construction, Schottky diodes are tremendously useful components in modern electronics. Schottky diodes fabricated using two-dimensional (2-D) materials have attracted major research attention in recent years due to their potential in transistors, rectifiers, radio frequency generators, logic gates, solar cells, chemical sensors, photodetectors, flexible electronics and so on. The understanding of 2-D-material-based Schottky diodes is, however, incomplete. Several theoretical models have co-existed in the literature and a model is often selected a priori without rigorous justifications. 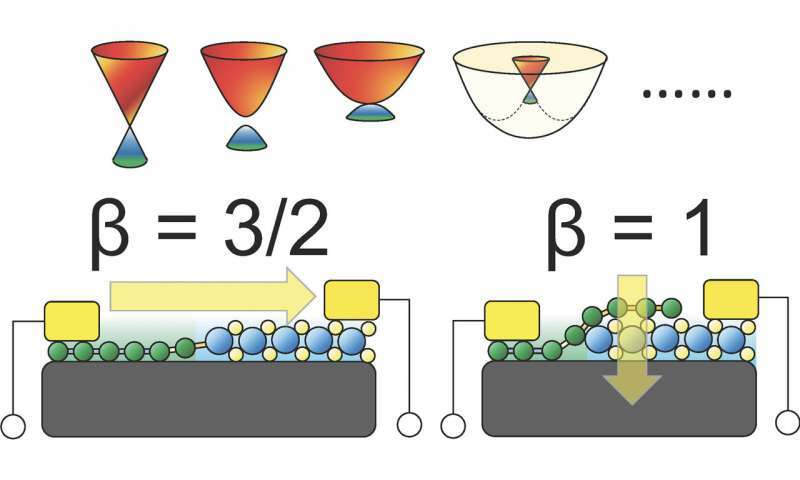 It is not uncommon to see an analytical model with underlying physics fundamentally contradicting the physical properties of 2-D materials applied for analysis of a 2-D material Schottky diode. Reporting in Physical Review Letters, researchers from the Singapore University of Technology and Design (SUTD) have made a major step forward in resolving the mysteries surrounding 2-D material Schottky diodes. By employing a rigorous theoretical analysis, they developed a new theory to describe different variants of 2-D-material-based Schottky diodes under a unifying framework. The new theory lays down a foundation that unites prior contrasting models, thus resolving a major confusion in 2-D material electronics. "A particularly remarkable finding is that the electrical current flowing across a 2-D material Schottky diode follows a one-size-fits-all universal scaling law for many types of 2-D materials," said first-author Dr. Yee Sin Ang from SUTD. Universal scaling laws are highly valuable in physics since they provide a practical "Swiss Army knife" for uncovering the inner workings of a physical system. Universal scaling laws have appeared in many branches of physics, including semiconductors, superconductors, fluid dynamics, mechanical fractures, and even in complex systems such as animal life span, election results, transportation and city growth. The universal scaling law discovered by SUTD researchers dictates how electrical current varies with temperature and is widely applicable to broad classes of 2-D systems including semiconductor quantum wells, graphene, silicene, germanene, stanene, transition metal dichalcogenides and the thin films of topological solids. "The simple mathematical form of the scaling law is particularly useful for applied scientists and engineers in developing novel 2-D material electronics," said co-author Prof. Hui Ying Yang from SUTD. The scaling laws discovered by SUTD researchers provide a simple tool for the extraction of Schottky barrier height—a physical quantity critically important for performance optimisation of 2-D material electronics. "The new theory has far-reaching impact in solid state physics," said co-author and principal investigator of this research, Prof. Lay Kee Ang from SUTD, "It signals the breakdown of classic diode equation widely used for traditional materials over the past 60 years, and shall improve our understanding on how to design better 2-D material electronics."